2 What does Being a Student Organiser Involve? This is not impossible - only difficult. This decade, a mass movement of students in Germany successfully reversed the introduction of tuition fees in their country. Likewise in Quebec in 2012, people organised a ‘Student Strike’, with thousand upon thousands of students walking out of class for months on end. 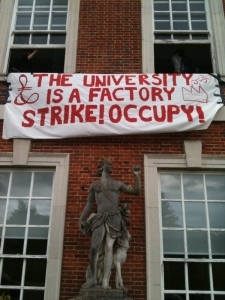 Along with other action, this managed to stop a hike in tuition fees. These are just a couple of examples, but the point is - it is possible to mobilise students to take militant action. ‘Student apathy’ is not an immovable barrier, just a temporary sleep that people can be roused from. The idea of this guide is to provide some pointers to the student organisers of the future - so they can learn from the experience and mistakes of the people who’ve written it. But we are not experts - no one really ‘knows’ what they are doing. The difference between someone who gets active and organises, and someone who sits back because they “aren’t the right person for the job” is just this - confidence. The only way to learn to be a good organiser is to get out there and start doing it. The term ‘student organiser’ is used to get away from the idea that most students are inactive and need a few superhero ‘activists’ to save the day for them.8 It is also used to get away from the idea that there are ‘student leaders’ who need to tell everyone else what to do. Everyone should be concerned by how managers, corporations, and the government are ruining education (not to mention our lives), and everyone can and should be resisting them. Finally, this guide will only continue to be useful if it stays up to date and grows - so please consider adding contributions from your own experiences! There’s no copyright, so you’re welcome to reproduce, reprint, and rewrite it whatever way you like. See the website http://studenthandbook.ourproject.org for the latest updates and contact information.